The Winnipeg Jets traded up to draft Logan Stanley at 18th overall in what was a fairly controversial pick for the Jets divided fanbase. Stanley since returned to the Ontario Hockey League. He has seen some development to his game, but is it enough? If you read my articles on Stanley pre-draft and post-draft, you could skip this section if you really wish. Prior to the draft I wrote that Logan Stanley could be a good player, so don’t draft him. The title paid homage to my friend Rhys Jessop, now working for the Florida Panthers, who predicted the Vancouver Canucks would likely regret drafting Jake Virtanen over the statistically superior Nikolaj Ehlers or William Nylander. My article was similar, predicting the Jets would likely regret drafting Logan Stanley with either their late first- or early second-round draft pick. 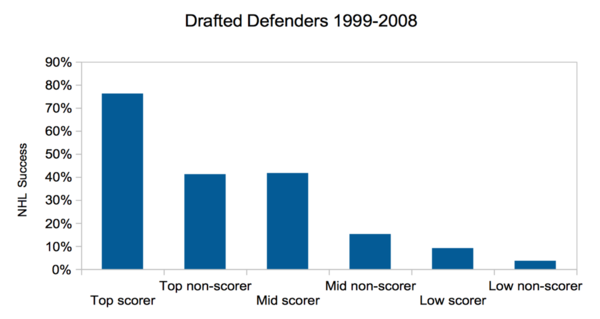 I then wrote another post on Draft Theory that expanded why scoring is so important for drafting, even with defenders. I pointed out how and why scoring matters, and even included some examples of the Jets’ drafting suffering due to undervaluing player production. The above graph is in both articles, but simply it shows the success rates for first round (“Top”), second round (“Mid”), and the remaining rounds (“Low”) for defenders drafted from the CHL. It then splits those three groups into those that have scored above and below 0.6 points per game in their draft season. The graph tells us two things. It tells us that NHL amateur scouts are likely detecting positive player attributes outside of their scoring. It also tells us that NHL amateur scouts are likely overvaluing those attributes relative to scoring, by nearly a full draft group. After the draft I then wrote why Logan Stanley could still be a good player. I pointed out that low or poor odds are not equivalent to no odds, but are just non-optimal odds. I took the small list of successful draft selections from the survey for “non-scoring” defenders drafted either in the “Top” or “Mid groups” that were 6′ or taller. This group of low-scoring cohorts will be what we use to compare Stanley to in this article, although keep in mind that it is not including the much, much larger list of all the first and second round defenders that did not make the NHL as regulars. The graph above shows Logan Stanley with the players drafted in the first two rounds that made the NHL by our previous definition, but also were early early draft picks (first two rounds or in the “Top”/”Mid” groups), played both their Draft and Draft+1 seasons in the CHL between 10 years, and scored less than 0.6 points per game. I also removed those that were under 6 feet tall. 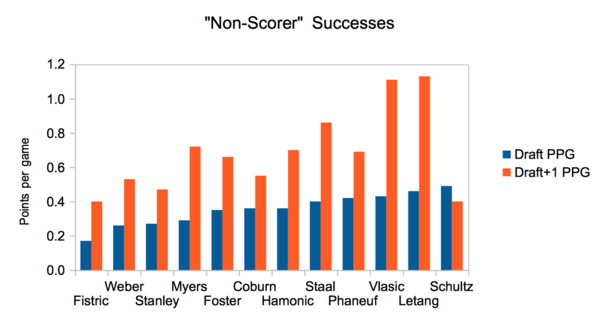 These are all the players that were Stanley’s compatriots, but it should be noted that scoring is a continuous variable, not binary. The 0.6 point per game pace is an imaginary line. The lower you sit on the scoring list, the relatively worse your position and therefore your odds. Stanley is the third lowest scoring on the Draft+0 scoring list. His scoring improved thus far this season by just over 70 per cent. This improvement is positive, but Stanley still sits third-last in Draft+1 scoring and improved by the 4th lowest percentage. While things may not be optimal, all is not lost. Stanley is not doomed to bust. He could end up being a NHL player; he could even end up a “plus” NHL player. Players who struggled to score still made the NHL. Shea Weber also struggled to score very similarly to Logan Stanley over their first two seasons (although it was during the WHL’s lowest scoring era). Still, his performance does not inspire great confidence when looking at the overall sample of those who have performed similarly before him. The few that did succeed are few and the exceptions to the rule. One should not bank on exceptions occurring, especially when hockey and improving your organization is a zero sum game: any advantage or improvement gained is a disadvantage to all other teams. There are some positive signs too. For one, Stanley places second in his team shots per game generation and even strength points per game production. Shot volume suggests the ice could be tilted positively for the Windsor Spitfires with Stanley on the ice. The even strength scoring could suggest that Stanley’s production would substantially improve if given power play opportunities. However, none of these are guarantees. Shot volume does not mean a player is good or will be a productive scorer (see Philadelphia Flyers’ Radko Gudas). Even strength scoring does not mean a player will be a productive power play performer and the reasoning for a player not being on the power play may be justifiable. Statistics are not destiny. They do not define what Stanley will develop into. However, we can use them to evaluate the Jets’ decision making processes and also track the success of Stanley’s development path. Late first plus early second round pick for LH-D Logan Stanley, 9 points, -1 in 19 games. Now lets take a look at the two players we could have drafted with those picks. LH-D, Kale Clague, 18 points, +5 in 18 games. RW, Alex Debrincat, 52 points, +31 in 24 games. Keep an eye on those two gems as they will almost certainly make some noise in the NHL in the future. Keep in mind they were picked up by LA and Chicago who seem to know a thing or two about spotting talent. My only hope is that trading up for Stanley was Chipman’s doing and it is the Jets equivalent of Daryl Katz insisting that MacTavish draft Nail Yakupov. Chevy better win some Cups because the Stanley trade could end up being his defining moment as a GM within hockey circles. Geez when I saw that 52 points in 24 games for Debrincat I almost puked. Ya, too bad Debincat’s not taller. Those goals scored by short guys in the NHL only count for half as much, right? I just can’t believe this moronic height bias crap is still going on. Saying that someone is not tall enough to play in the NHL is exactly the same as saying someone is not white enough to play in the NHL. It’s flat out discrimination. Please do not equate race discrimination with height discrimination. Perhaps you can explain the difference to me? No one gets to choose the colour of their skin or their eventual height. Debrincat is not very fast. Which seems to be main knock on him. He seems to score pretty quick!